This year is flying by, hasn't it? It seems like February was just a week ago and here it is almost June. Well in spite of the fact that I seem to be living in a time warp, I have been one busy bee! As you can see, I've been making cupcakes... lots and lots of them, one-hundred and sixy of them to be exact! And not just any cupcakes, but wedding cupcakes. My favorite kind! The days that let up to Mother's Day weekend were very busy around my house. Not because it was Mother's Day, but because I had to be ready for Chuck and Leslie's big day! They got married in a gazebo, in the charming little town of Poulsbo, Washington surrounded by their family and friends. Their reception was hosted just a few yards away at a roof top restaurant called The Loft. It was a gorgeous venue that not only had incredible views of Liberty Bay, but had some of the best food I've ever had at a wedding. I made a total of 160 cupcakes, in two different sizes, and four different varieties: Chocolate Stout with Whipped Chocolate Ganache Frosting, Southern Red Velvet with Sweet Cream Cheese Frosting, mini Luscious Lemon with Lemonilla Buttercream, and my personal favorite, mini Homemade Caramel with Caramel Browned Butter Frosting. I even made a little cupcake menu and displayed it near the cupcakes so the guests knew what they were eating. 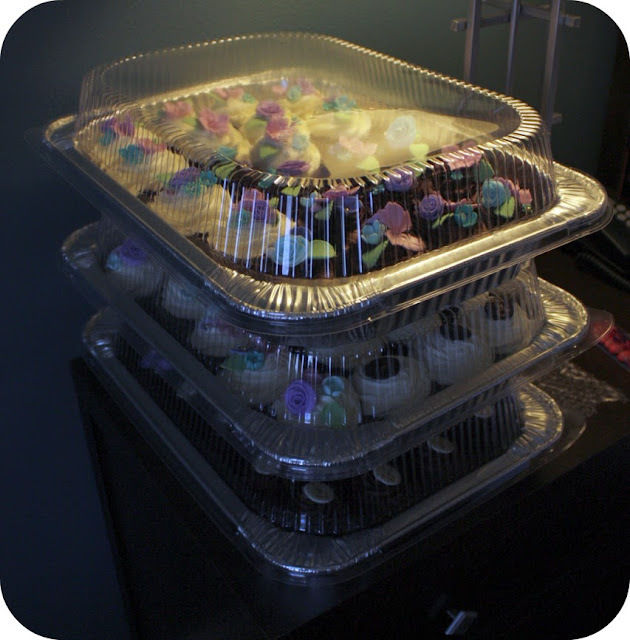 The trickiest part of this order wasn't its sheer size, but it was the logistics of getting the cuppies there and setup intact. 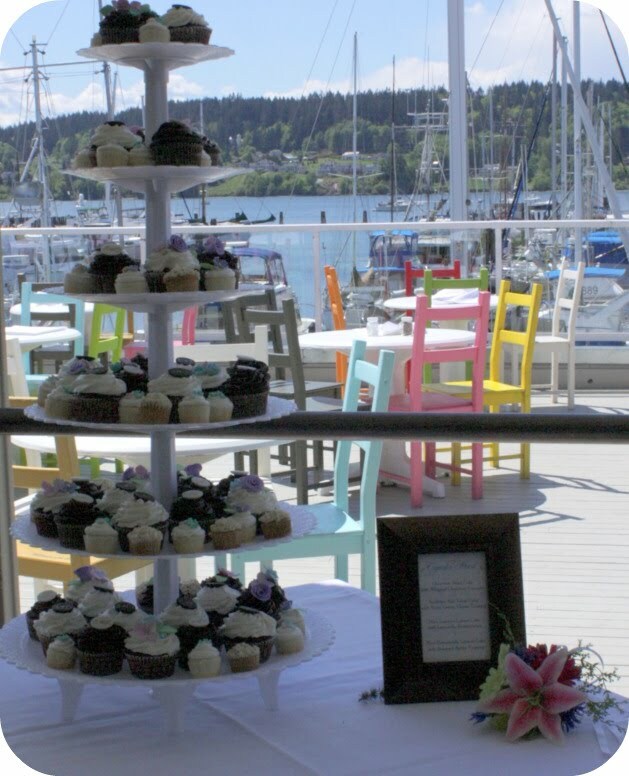 Poulsbo is a few hour journey from my house, so I decided that instead of stressing out the day of the wedding and rushing, I'd pack everything up that I'd need, stay at a hotel near the venue the night before, and assemble everything there. This was no small task but proved to be the right choice. I got up early Saturday morning, started with the whipped chocolate ganache (I had to whip it there in my hotel room with my stand mixer!) and worked my way through through the menu. I wished I had more time to decorate each cupcake a bit more thoughtfully, but overall the end product looked very close to what I had envisioned. 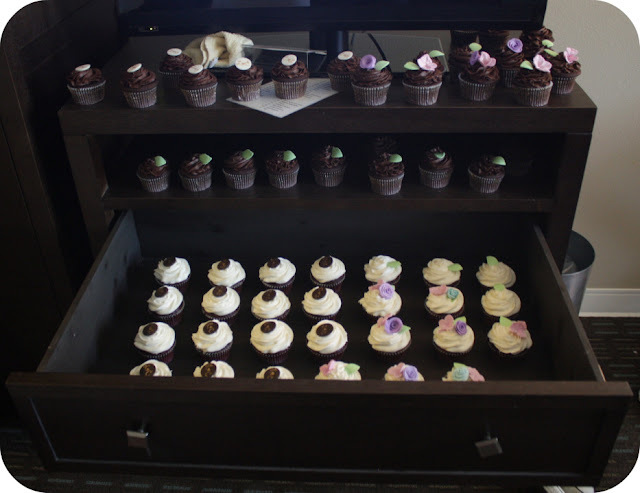 I had to use a drawer to hold some of the cupcakes because I ran out of counter space in the hotel room! 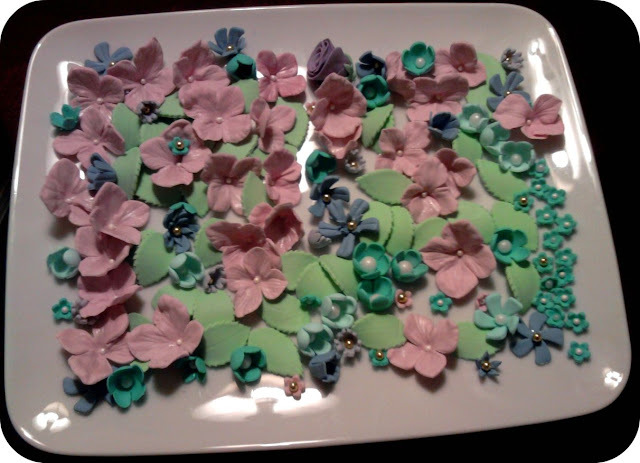 I made all the flowers and leaves that you see in the photos out of gum paste (about 300 all together.) 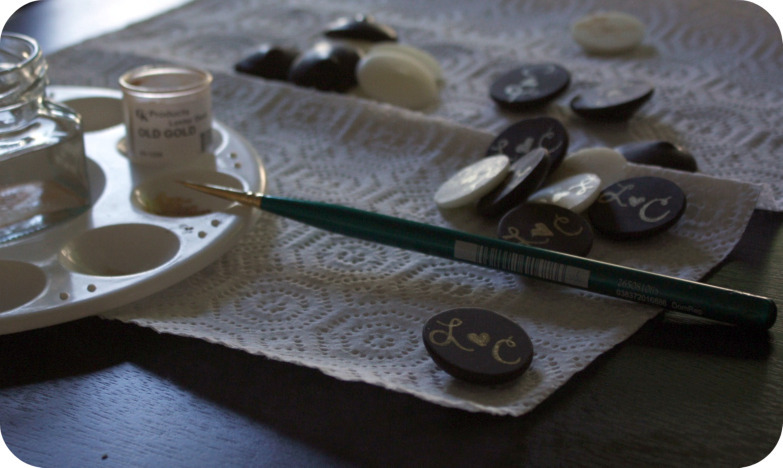 I started working on them on and off about two week before the wedding and right up until a few days before the wedding! Some were very elaborate, like the roses, which took me about an hour to make each one. Eventually I got it down to about 10 minutes per blossom. In addition to the roses, I also made about seven different varieties of other flowers, including daisies, buttercups, and hydrangeas. 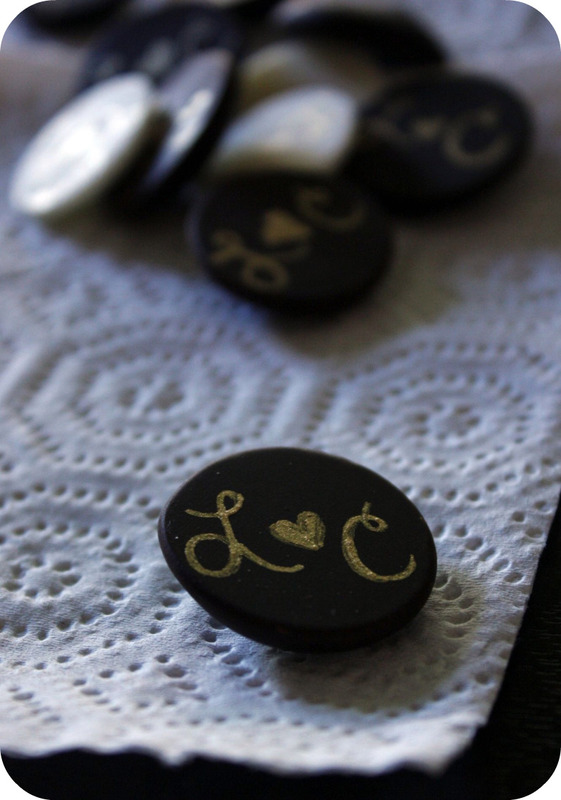 And for variety I also hand-painted the bride and groom's initials onto white and dark chocolate wafers using gold luster dust. asion. I was lucky enough to be a guest at the wedding and had a great time meeting Leslie and Chuck's family and friends. It was a little strange for me to be at the event and actually watch my work be consumed (I usually like to cut and run), but it was a joy to see. It was such a glorious, wonderful event and I was so beyond thrilled to be a part of it. Congratulations Leslie and Chuck! I'm already looking forward to making your 1-year anniversary cake! Preheat oven to 350F degrees. Line a muffin tin with cupcake liners. Whisk the cake flour, cocoa and salt in a bowl. 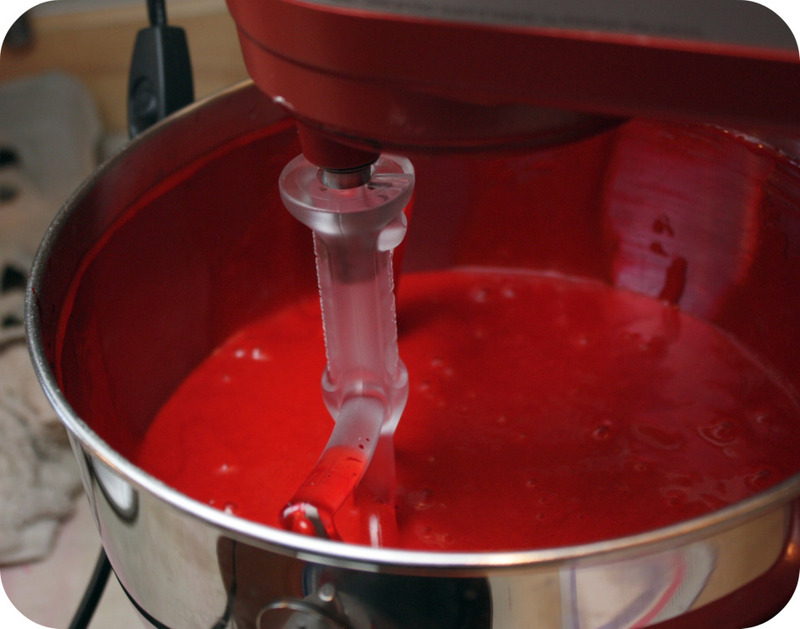 Place the oil and sugar in bowl of an electric mixer and beat at medium speed until well-blended. It will look thick and yellowy. Slowly beat in eggs and mix for one minute at a time. After the last egg is added, mix on medium speed for 30 seconds and clean off your blade. Add the vanilla. Take a minute and make sure you have nothing blocking your way between you and your mixer. Make sure your mixer blade is secured and the bowl is locked in tight. Seriously, what you are about to do can turn you and your kitchen a dull shade of pink in a blink! With machine on the lowest setting, slowly, I mean very slowly, add red food coloring. Adding just a squirt here and there and take your time to let it mix at least 10 seconds in between each addition of color. Do not add a bunch at once. Remember to keep the speed to a minimum to avoid splashing. When all the food coloring is added, carefully scrape down the blade, the bowl, and let the mixer run for a good solid minute. Add flour mixture alternately with buttermilk in two batches. When you add the flour, use a small spoon to premix the flour into the red batter a little. This will help avoid the flour from escaping in a cloud in your face. Scrape down bowl and beat just long enough to combine. Place baking soda in a small dish, stir in vinegar and add to batter with machine running. 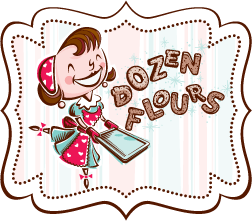 Note: if you mix together the vinegar and baking soda and you get just a little fizz, go to the store and buy new baking soda! This is what will make your cupcakes rise so don't cut corners here. Beat for 10 seconds. Don't fret, the batter will be runny. Let them bake for about 15-18 minutes. After 15 minutes, check to see how they are doing using a toothpick to test. You know they are done when a few little bits of cake stick to the toothpick. Remove the pan from the oven and let rest on a wire rack for about 5 minutes. Remove the cupcakes from the pan and let cool completely. Would I Make This Again? Honestly, I don't like red velvet cake and I grew up in the south! However, out of all the red velvet cake I've ever had, this was the best. Moist, light, just the right amount of chocolate. Pretty darn good! You did such a wonderful job on the cupcakes and the flowers. I am so impressed that you did all that from a hotel room! 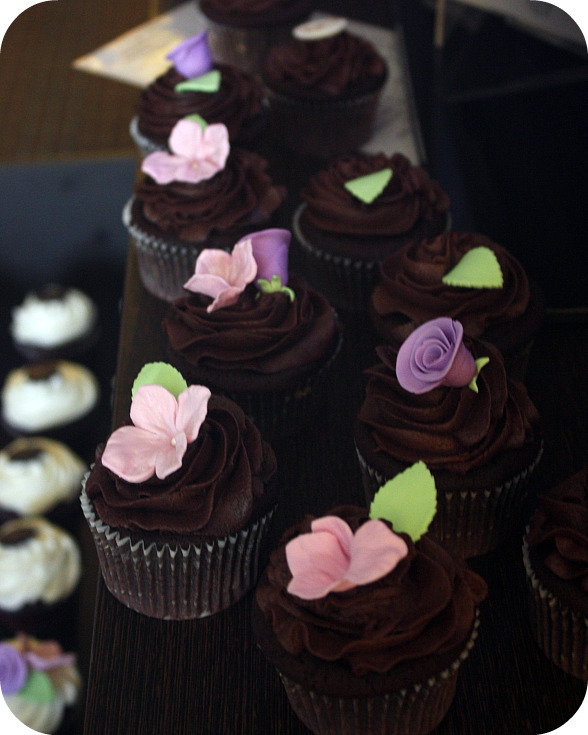 And I personally love the soft pinks and purples against the dark chocolate frosting- stunning. Stunning work on the cupcakes! I love the variety. My mom decorated wedding cakes when I was very young. I remember the trays of roses in the refrigerator waiting to 'set up' before taking the cakes to the church for assembly. My brother and I used to sneak a rose to taste here and there. Until one day she took an entire cookie sheet full out of the fridge, drew a line down the center and made us each eat half the sheet full. The luster dust for their initials is so great! Girl after my own heart- working right out of the hotel! These came out SO awesome! I love the stand, too. 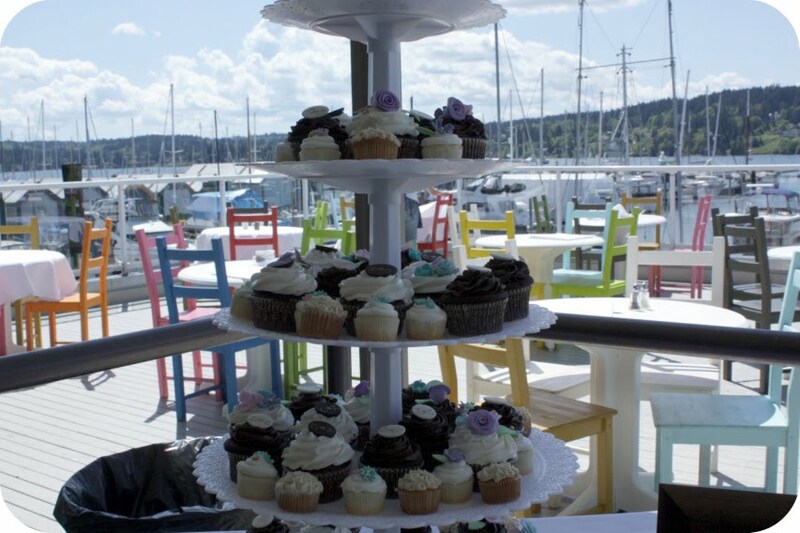 It goes perfect with the backdrop of the boats! 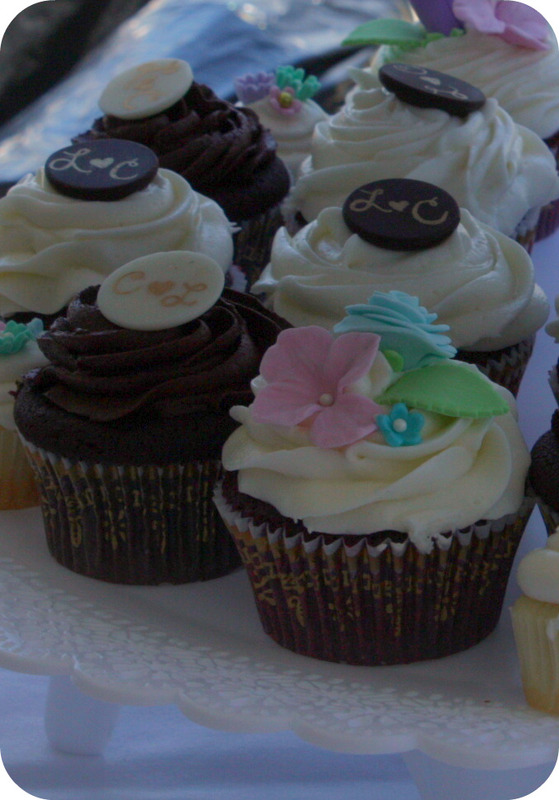 I was lucky enough to attend the wedding and rest assured that the cupcakes were as delicious as they were beautiful. Though, I an not sure which was my favorite, so maybe I can try them all again? On a side note; Can I hire you to make my next Chuck Norris themed Birthday cake? Thanks Monica! I didn't think I'd like the flowers against the chocolate and had originally planned to use the chocolate disks to decorate them. But when I put a flower on one, it looked so pretty! Hey Anonymous -I'm so glad you liked my cupcakes! And of course I'll make you a Chuck Norris cake! I know just what I'll make too: a big cake that just says "Booyah!" in big block letters! Deal? Beautiful flower decorations for the cupcakes. You have more patience than I do. Just gorgeous, Julia!!! I've missed your blog posts! Nicely done, Julia! I can't believe you finished them up in your hotel (& you brought your stand mixer!). Here I was freaking when I thought I'd have to make a hundred and transport them an hour away. Thankfully you convinced me to go the dessert table route. Btw, I love your new photo. You look younger Julia! How'd you manage that? I must know your secret. These are lovely cakes in lovely colors. They look so perfect for my daughter's birthday. Cupcakes are so cool when it comes to group occasions. You can make so many in little time and everyone likes them. Great idea about weighing the cupcakes...I like that idea better than measuring. Your cupcakes look so incredible! I love the way you have them arranged for the wedding. It's hard to believe you did so much from your hotel room...did you think of asking for space in the hotel's kitchen, or would that have been rude? Much wishes for happiness and a long life for the bride and groom! Actually I didn't ask to use the hotel's kitchen because I just wanted to keep the cupcakes under my supervision. If I had used the hotel's or reception's kitchens, I would have been too freaked out by the idea of someone touching them. The hotel did give me permission to use their conference room if I needed it though, which I thought was very nice. Thanks to everyone else's kind comments too! School is out for the summer and I finally had a chance to check out your blog. 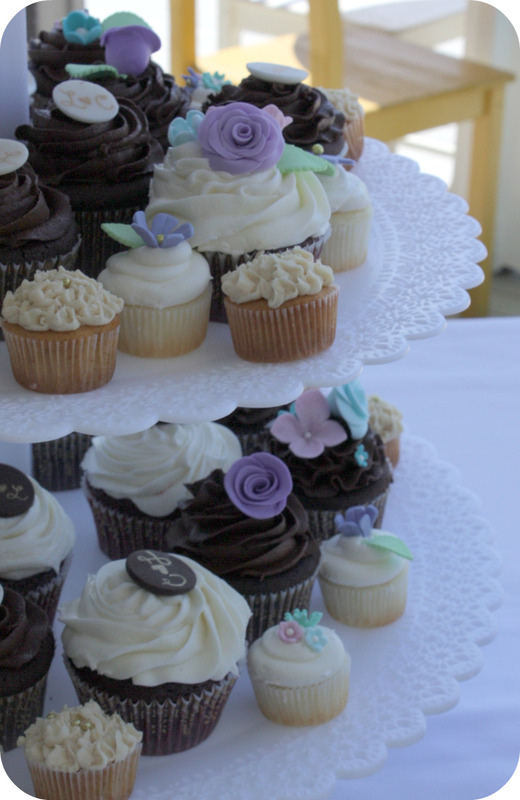 I attended Chuck and Leslie's wedding and fell in love with the carmel browned butter cupcakes. I have never tasted anything like them! Most creative wedding cake I've seen. Thanks so much for sharing the recipe. I plan to dazzle friends on the east coast! I really love those cup cakes. .yummy. . wow. . .thanks for sharing it to us. .